I love earning points with the Ink Business Preferred℠ Credit Card and Chase Sapphire Reserve® because I rarely have to pay for hotel stays. 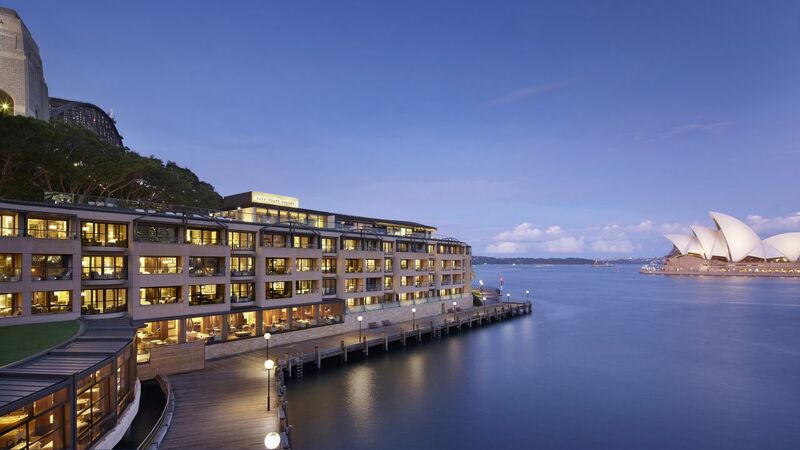 I just transfer Chase Ultimate Rewards points to my Hyatt account and book free nights. I even use my points to book award stays for friends and family, including a recent one night stay for my sister-in-law and her boyfriend at the historic Bellevue Hotel in downtown Philadelphia. Another perk of booking a points stay at Hyatt is the chain has a “no blackout date” policy. As long as a standard room is available for sale, you can book it using points. But this perk has been a bit lackluster for me lately because I’ve struggled to find available standard rooms at certain hotels. What I’ve learned is certain Hyatt hotels force you to book a 2-night minimum stay on the weekends or around peak travel dates. 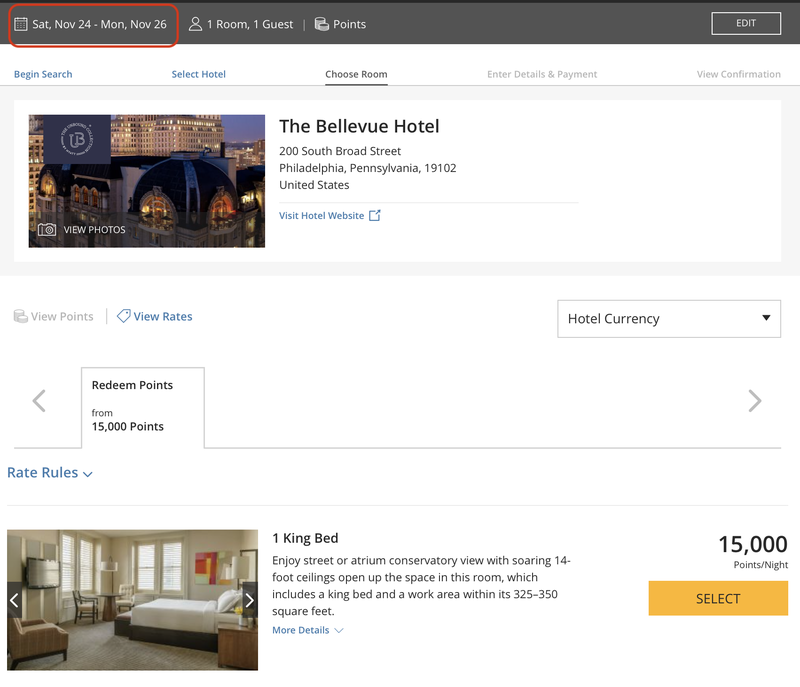 This means you might not be able to find a standard room available to book with points or cash if you’re only traveling for one night. But during a recent booking, I might have uncovered a sweet trick to get around this inconvenience. 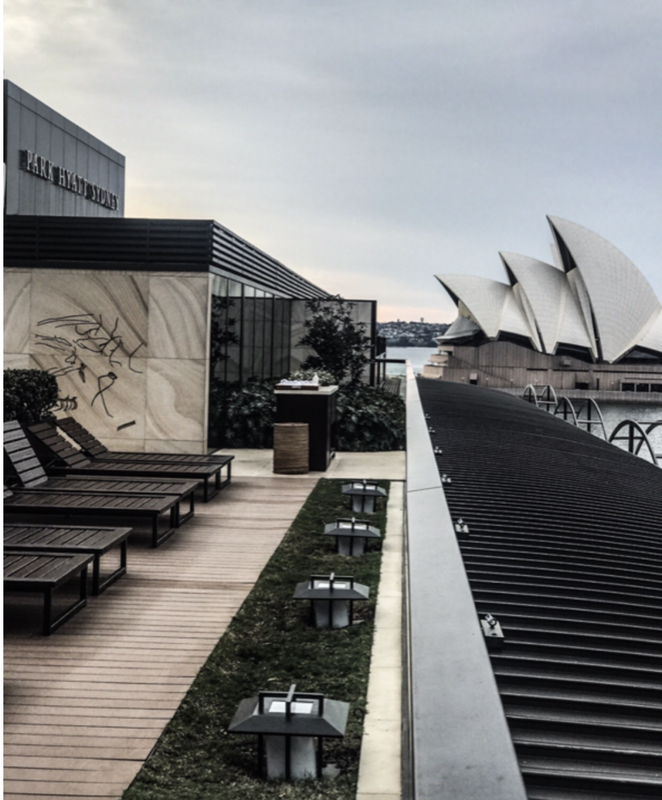 I Love Transferring Chase Ultimate Rewards Points to My Hyatt Account to Book Luxurious Stays at Top-Tier Hyatt Hotels, Like the Park Hyatt Sydney! I can’t guarantee this method will work for you, but it’s definitely worth a shot! My wife and I typically travel on the weekends, which seems to coincide with when certain Hyatt hotels require you to book a minimum stay of 2 nights. But often times, we might travel to a destination where we’re only looking to use points for one night. My trick requires a bit of trial and error, but here are the steps. 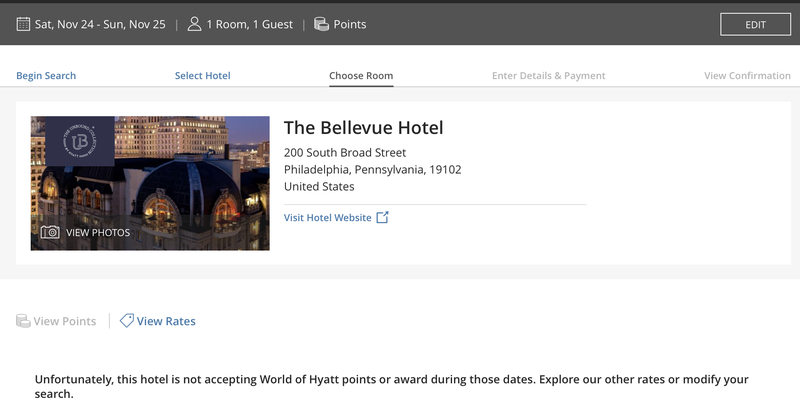 In this sample booking, I’m looking for a one night award stay at The Bellevue Hotel in Philadelphia (checking in on Saturday, November 24 and checking out on Sunday, November 25). As you’ll see in the below screenshot, the result says the hotel is not accepting award bookings for the one night. But don’t give up just yet! If I search for a 2-night stay (checking in on Saturday, November 24 and checking out on Monday, November 26), the hotel shows award nights are available for 15,000 points per night. Go figure! So if your goal is to only book a Saturday night stay, you’ll have to book the 2-night stay temporarily to take advantage of my suggested trick. As you’ll see in the next step, you should be able to get a refund for the cost of one of the nights. So the 2-night booking is only temporary. It’s Magic! When I Search for a 2-Night Award Stay Using the Same Check-In Date, Hyatt Shows Me There Are Rooms Available to Book With Points! Keep in mind, if you’re transferring Chase Ultimate Rewards points to your account to make the award booking possible, you will NOT be able to transfer Hyatt points back to your Chase Ultimate Rewards account. You might be able to call Hyatt customer service to adjust your reservation. 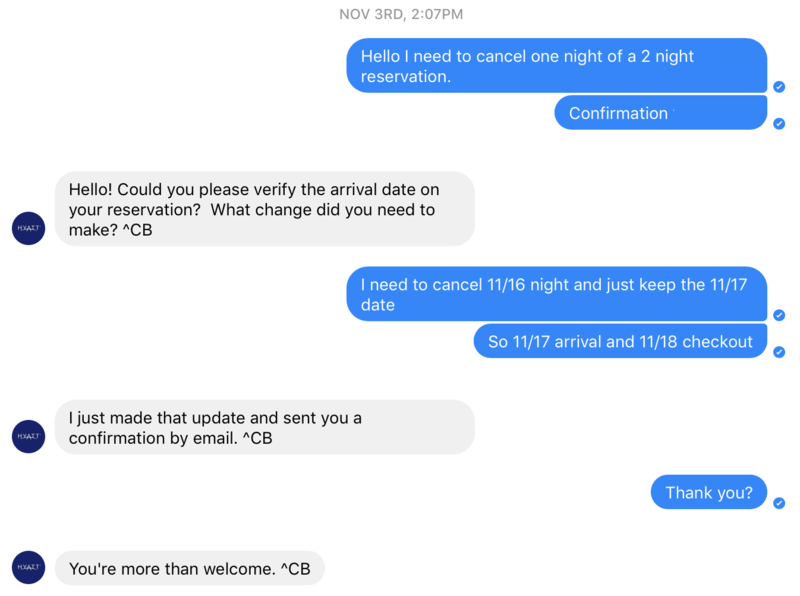 But I found it super simple to just send Hyatt a message through Facebook Messenger requesting to adjust my reservation. In less than 2 minutes, the customer service rep changed my reservation and refunded the points back for the night I wanted to cancel. The refunded points appeared in my Hyatt loyalty account instantly. Be Sure to Read the Hotel’s Cancellation Policy! I highly recommend reading the hotel’s cancellation policy before you try this trick. For example, if you try this tactic for a last-minute award booking, there’s a chance Hyatt will not adjust your reservation. This means you could lose your valuable points. If you have any other tips for getting around blackout dates or minimum stay requirements, I’d love to hear from you in the comments below! I ran into this two night minimum once before. Wish I’d have known about this workaround. I’ll be ready next time.